Keeping Up With The Joneses' Latest Medical Procedure : Shots - Health News Having reached the average life expectancy for an American male, Dr. John Henning Schumann's father is acutely interested in his buddies' illnesses and treatments. Call it "medical me-tooism." My father is approaching his 78th birthday, blessed with health good enough to still be an avid golfer and tennis player. His regular group of tennis buddies changes from time to time. The lineup depends on how they're feeling. I remember when one of the gents renowned for his fitness and fastidious diet underwent a quadruple-bypass heart operation. The other guys were in shock. If Mr. Fit had a bum ticker, they all figured they better get to their doctors pronto. "Don't I need an operation or something to clean out my arteries?" Dad asked me. It doesn't work like that, I explained. We don't recommend [they are done, let's be honest] preventive heart surgeries, though many people make that assumption because of our culture's worship of the latest, greatest medicine and technology. Heart surgery should be considered disaster relief, I told him, not part of a regular tune-up or a solution for unhealthful habits. When my father saw his own doctor a few weeks later and got his usual clean bill of health, Dad wasn't satisfied. There must be some danger brewing somewhere inside him, he told me, despite reassurances from me and his doctor. His concern faded after a while, but then several months later one of his cronies underwent a knee replacement. Dad's first reaction: "When should I get my knee replaced?" I tried to talk him through it. "Do you have pain with every step you take?" I asked. Clearly not, I thought, since he's still playing tennis three times a week. He admitted that his pain is only intermittent. But as he has aged, he's grown concerned that his balance has become wobbly. I can't fault my dad. He's a child of the 1950s and has an unshakable belief in American ingenuity and medical progress. Newer is always better. For patients like him, more medical care equals more health. If there's one thing he and I have battled over (and as his doctor-son I'm sure I've disappointed him in this regard), it's my insistence that quite the opposite is usually true: less is more in medicine and health care. In the last decade a whole science has arisen to examine medical overuse — a big contributor to our country's world-leading health care costs. These talks with Dad got me thinking about his way of looking at things. I've even coined a name for his impulses. I call it, "medical me-tooism." It reminds me of a millennial's fear of missing out (FOMO! ), but for the geriatric set. One thing's for sure, my father's not alone. In clinical practice, I see medical me-tooism frequently. Take my patient Jack. He's 89, and he only stopped playing tennis when he moved to town from Las Vegas a year or so ago to be closer to his son. Jack was awarded a Purple Heart in World War II, and he sees every day as a gift. But at a recent visit, he told me that out of a group of 13 childhood friends from his original neighborhood, only he and one other remain. "Isn't there some pill I can have," Jack asked, only half-jokingly, "to keep me in good health?" He does take a few medicines, one for blood pressure and another for heartburn. Medically speaking, I think Jack is happier to do less, but his anxiety persists about his good fortune. It's a form of survivor's guilt. Classically, survivor's guilt is reaction to war, trauma, or natural disaster: Why did I live when others perished? But it exists in the medical realm, too, especially for cancer survivors who see many of their afflicted compadres succumb to illness, suffering and death. When I approached my father for permission to write about him, he and I wound up having a heart-to-heart talk about the indignities of our aging bodies, life and its natural end. He didn't entirely buy my view that he suffers from medical me-tooism when it comes to his tennis buddies. But he agreed conceptually that medical me-tooism is really a form of survivor's guilt. Having reached the average life expectancy for an American male, my father is acutely aware of life's limits. Sadly, many of his friends have dropped from the tennis group, never to return. Some have died while others became too feeble to continue playing. 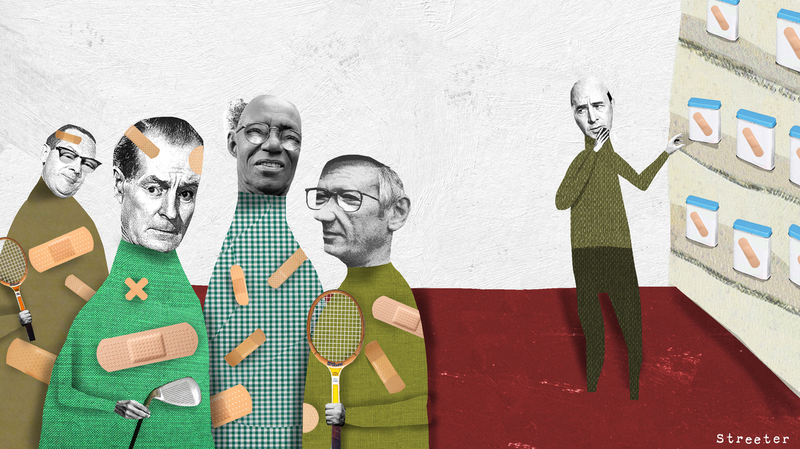 Still, compared with their peers, the tennis elders seem to be enjoying life and living longer than their spectating counterparts. The observation is anecdotal, to be sure, but I'm convinced it speaks to the value of moving around and socializing. Those are two things my father and I fully agree on.